The Swiss Peaks 360 — a 360-kilometer trail race through the high country of the Valais Alps, beginning near the headwaters of the Rhone River and paralleling its valley all the way to Lake Geneva. It's a fantastic concept, and this was the first year for the long event, which offered 25,500 meters of D+ (84,000 feet of climbing) on a marked course with a 160-hour time limit. With the success of the Tor des Geants, these multi-day trail races are gaining traction in Europe, and the first-year event had more than 300 runners at the starting line in Oberwald. When Beat signed up for this race, I never took him seriously. He was already committed to another Petite Trotte à Léon, and Swiss Peaks started three hours before the final cut-off of PTL. There were grand declarations that he and Pieter would finish Saturday night (something Beat had managed in two out of six PTLs), grab a few hours of sleep, and get in the car for a three-hour drive to the start of Swiss Peaks. Again, ridiculous. At best the endeavor involved unbelievable sleep deprivation and physical suffering, with unacceptable risk and danger at worst. I voiced my opposition from the beginning. I even threatened to not aid and abet in this ridiculousness by refusing to drive them to Oberwald. My threats were not taken seriously. Perhaps as a coping mechanism, I chose to believe that Beat would never start the Swiss Peaks 360. It just wouldn't happen. Instead we'd find something more pleasant and relaxing and fun to do in Switzerland during the week. Or we'd just hunker down somewhere and work. Both sounded so much better to me than dragging through yet another race. I admit to some burnout. I didn't expect this, having run none of my own races this summer, but lingering on the periphery of these long events was beginning to get to me. Bryce 100, Hardrock 100, Ouray 100 ... so much hurrying up and waiting, living by schedules that weren't mine, eating from remnants of crappy food, staying up all night. To be clear: I enjoy being a part of Beat's races, and volunteered to crew these events. But mid-way through PTL, I realized that something had cracked. This feeling came on quickly, like a wave of nausea that leaves one feeling fine one minute, and rushing to a bathroom the next. 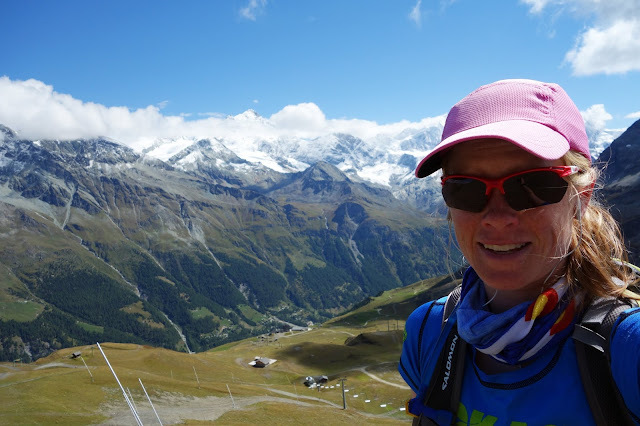 I was walking through the UTMB expo in downtown Chamonix and thought, "I am so sick of running." The realization startled me. In assuming Swiss Peaks would never happen, one outcome I hadn't anticipated was Beat's partner needing to stop PTL early due to injury, while Beat remained healthy and raring to rectify a DNF. Of course Beat couldn't start the Swiss Peaks fresh — he still did 115 really hard kilometers followed by only three days of rest. But this situation was more realistic than completing both. 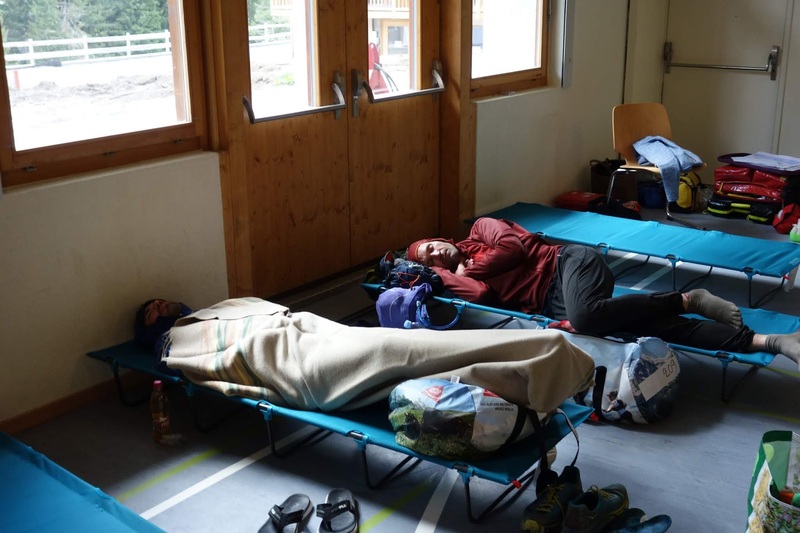 The Swiss Peaks course seemed less dangerous than PTL, and Beat had managed plenty of sleep beforehand. I could swallow my own nausea and be supportive. So on Sunday morning we woke up in Chamonix and drove to Oberwald. 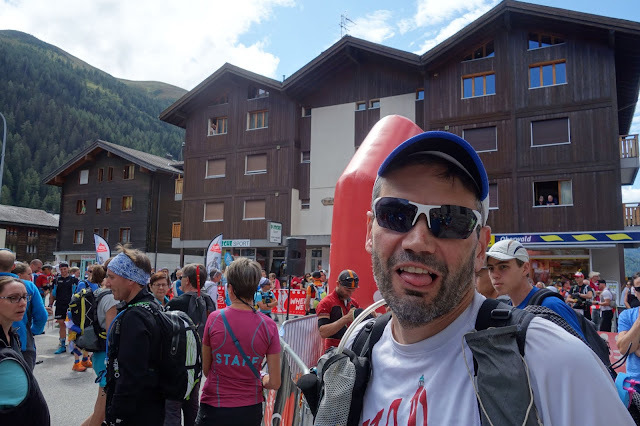 The race started under clear skies and soaring heat at 1 p.m.
One big drawback of not believing Beat would start Swiss Peaks is that I made none of my own plans. Initially, he said he didn't think he needed any crew support, and I should spend the week on a trek of my own. 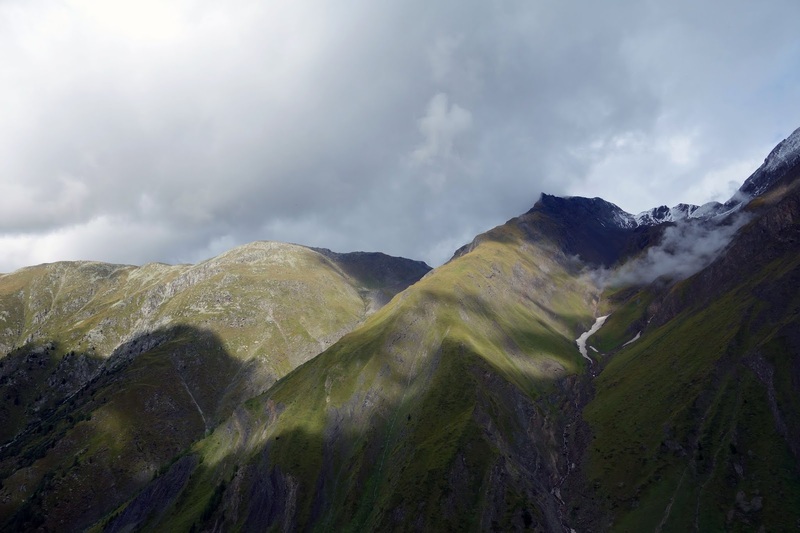 I looked into hiking the Haute Route — a bit too long and out of the way — or a self-planned trek in Valais, but became frustrated with the logistics. Backpacking in Europe isn't as simple as it is in the western U.S., where one can hike freely all day, throw down a tent almost anywhere, and replenish supplies at any number of small-town convenience stores that are open all night and on Sundays. Here, wild camping is at least discouraged if not outright disallowed, so one must plan their exact mileage and schedule every day, make reservations at hotels, refuges and village campgrounds, and map out places to buy meals or groceries based on the limited hours they are open, doing all of this research through a language barrier. It's all a bit daunting for a non-planner such as myself. In some ways, signing up for a 360-kilometer supported race is easier. I can see why these events are becoming so popular. 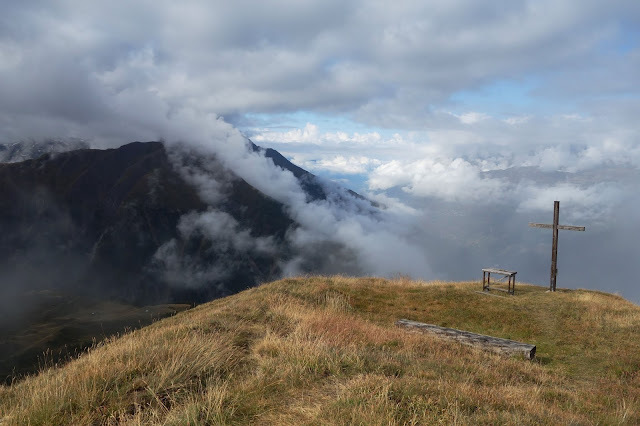 My fall-back plan for the week was to bounce through each of the Swiss Peaks life bases and stealth-camp nearby. For this purpose I brought a bivy sack, a Thermarest and a light sleeping bag. Driving to Oberwald on Sunday morning, I realized that this wasn't a great plan. I might be in for a hard week. I also had a couple of physical issues to add to my concerns. My right Achilles, which has been acting up on and off all summer, was incredibly tight again after a big week of climbing in Chamonix. And there was also the hematoma on my right shin, still painful and swollen after I bashed my leg on the sharp edge of a boulder in Colorado two weeks earlier. I was beginning to wonder if this purple goose egg was possibly masking a minor fracture. One would assume that a broken bone is much too painful to use in the way I'd been using it. But then again, runners' stress fractures are a thing, and I've known other friends with blunt-trauma breaks who managed to walk on them for weeks or months before finally getting an X-ray, a cast, and many weeks of recovery. I did a little bit of WebMD research, which was inconclusive. Mostly I wanted to keep doing what I'd been doing, which is ignoring the persistent dull pain until it got better. That sounds like a terrible plan, and it probably was. Now, two weeks later, with pain and swelling gone and bruise almost faded, I can write off these concerns as a symptom of my mental state that week, which was ... well ... a bit weird. I'll expand on that soon. 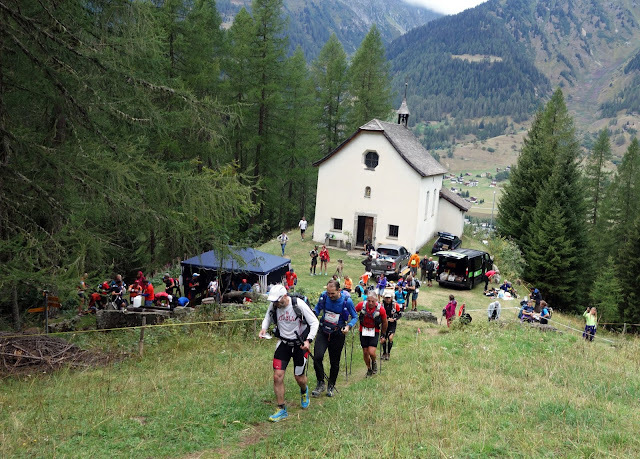 So, with the "ignore" plan in place, I deciding to take my sore shin, tight Achilles and fatigued leg muscles on a trek from Reckingen, a secondary aid station at kilometer 27 of the race. 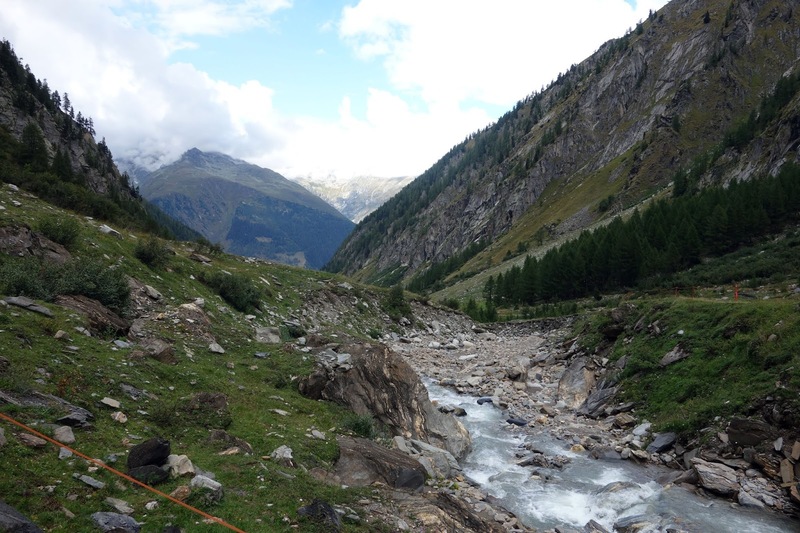 I followed the course flags along a nicely graded forest road that climbed into a beautiful valley with a cascading stream and views of fresh snow on the Blinnenhorn ridge, bordering Italy. "Swiss Peaks is a nice race," I thought. 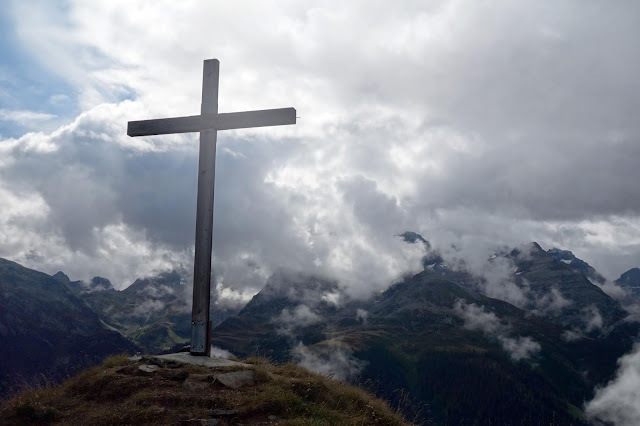 Then, five kilometers into my own hike, the teeth came out as the Swiss Peak flags suddenly shot up a primitive, rocky path that barely cut through thick brush on a brutally steep slope. The sky threatened rain and the trail was already slicked with mud — terrible conditions for my Achilles — but I was being weirdly stubborn about this whole thing and kept climbing. My monkey mind had been racing all morning, and finally, here on this sinister mountain, it was calm. The tranquility was worth the pain. 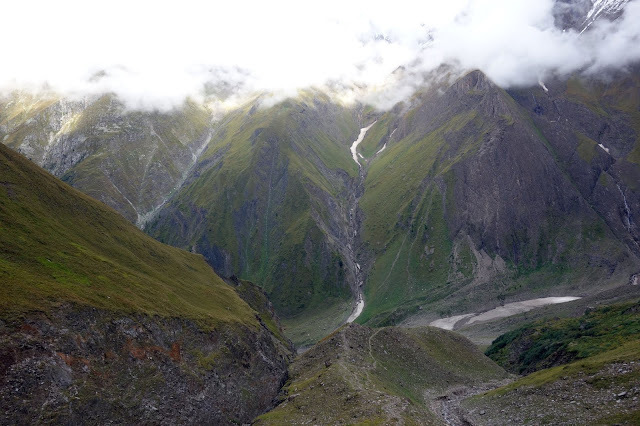 Evening was closing in as I climbed into clouds above 2,400 meters (8,000 feet) and realized that the peak — Chummehorn — was still a thousand feet higher in what had to be not much more than a half mile. And it was starting to rain. Oof. "Swiss Peaks is a mean race," I thought. I'd calculated when I thought Beat might arrive in Reckingen and set a time limit on myself, which I'd already surpassed, so I turned around. Back in the valley, I had to weave through a thick herd of cattle, after which I encountered this jovial farmer. He talked at me incessantly for at least five minutes as I nodded and laughed, but could only guess that he was funny, as the only repeated word that I understood was "essen." "Yes, yes, dinner time," I responded. As we chatted, the first runner and ultimate winner of the Swiss Peaks 360, Patrick Bohard of France, passed by. The farmer turned and talked at him. Patrick didn't respond and I snuck away. "This guy is going to have 300 racers to talk to soon enough," I thought. My calculations on my own pace were incorrect, I ended up missing Beat at the aid station, but just barely. He was climbing out as I descended. I'd purchased a sandwich and Apfelschorle for him that was in the car, but no matter. 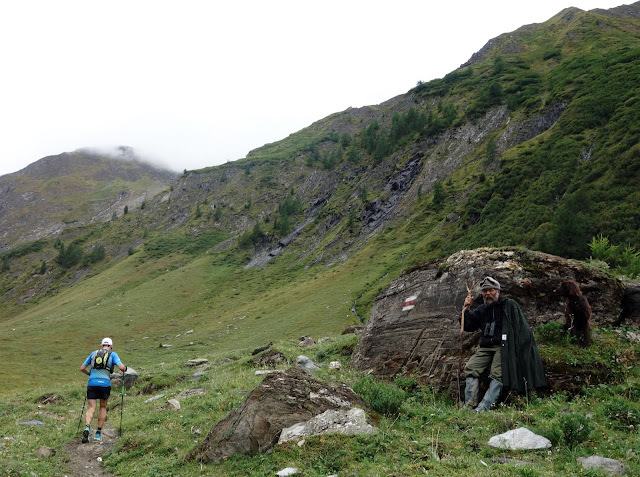 He was moving strong and chatting with Dmitry, a Russian friend with whom he'd traveled much of the 2012 Tor des Geants. I was glad he had a partner. As the sun set, I drove to the next life base in Binn, at kilometer 56. 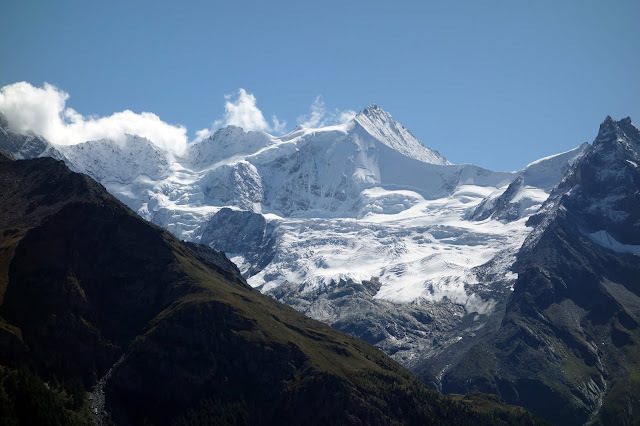 For Beat it was a direct jaunt over two enormous mountains, but I had to descend into the busy Valais corridor and then climb a winding and narrow mountain road to the next high-altitude station. This would prove to be the theme for the week — it was at least an hour of driving to get anywhere, often an hour and a half, and all of the driving was stressful for me. Probably more so than it should have been, but I don't know my Swiss road laws as well as I should, and none of these mountain roads were actually wide enough for two vehicles to fit side by side. Driving here involves a lot of pulling over, both for oncoming traffic and aggressive drivers coming from behind, on roads with a sheer drop-off on one side and a cliff or stone wall on the other. The final kilometer into Binn cut through an incredibly narrow tunnel. It definitely only looked wide enough for one vehicle, but there were no signs or lights to indicate which direction it traveled, or how to deal with oncoming traffic. As I pulled up to the tunnel, I saw lights approaching, so I pulled over. After that car left the tunnel, I pulled up again, to more lights. I waited there for at least ten minutes as car after car went by, and finally saw an opening. I gunned the gas into the darkness, only to see more oncoming headlights. Damn it! As it turned out, there were a few pull-outs inside of the tunnel, which the oncoming car used. But, really, how is an American driver to navigate such a free-for-all? Self-regulated single-lane streets are not common in the U.S.
Now completely rattled, I arrived in Binn at dusk and pulled into a campground. Feeling embarrassed about not having a tent, I waited until dark to throw my bivy sack on the ground, and ate a dinner that consisted of a can of tuna, cheese, apples, and cherry tomatoes. I continually checked my phone for Beat's position, but never got the tracker to load. This would prove another major stressor for me over the week. The tracker never worked properly for him, not once, so I had to guess his arrival times with nothing to go on. At least in past races without tracking, I had splits to work with — if not his own splits from past years, then a list of splits from current event for people ahead of him. Swiss Peaks didn't even list the runners' positions, so I had absolutely nothing. I had been reduced to the math of distance, D+ and a rough kilometer-per-hour pace, which I used to guess that he'd probably arrive in Binn around midnight. At 10 p.m., I crawled into my bivy sack and set an alarm. The rain woke me up before my alarm, pelting my bivy sack with jarring force. I startled and sat up inside of my bag, then wrestled my way out as confusion sank in like a thick fog. Where am I? For some reason, my addled brain fixated on this idea that I was in the Tour Divide, so much so that I looked around for my bicycle. There was no bicycle. There was a gray car. Was that my car? I don't know this car. Where am I? When is this? The brain fog persisted for more minutes than I care to admit, and I became increasingly distressed about my amnesia. This wasn't just the effects of waking up from a deep sleep, this was more like the brain fog I experienced when my thyroid disease was at its worst, and I began to fear early-onset dementia. Coming back to reality — Switzerland. Swiss Peaks. 2018. Rental car. Beat — just caused me to feel disheartened. I was already convinced I was facing a period of low function, and this was before the anxiety intensified, insomnia set in, and I forgot to take my meds for at least three days (genuinely just forgot.) I was in for a rough week. As it turned out, my guess at Beat's arrival was off by a half hour, and I caught up with him just as he finished his meal and was about to snooze for a couple of hours. I waited in the car, wrapped in most of my coats as the temperature dropped to 3C, but couldn't sleep anymore. Beat and Dmitry left around 4 a.m., and I thought about leaving myself, but there was no way I was driving down that road in the dark. Sleep still eluded me, so at dawn I set out to avoid the tunnel for a little longer by hiking on the Swiss Peaks course up to the Eggerhorn. This was a pleasant hike. Steep, but not technical, with sweeping vistas. The weather was improving, but the surrounding mountains were still mostly shrouded in cloud. All of the runners had already passed through, and it was eerily quiet. I was surprised that the race organization had already removed most of the flags, but not all of them. As it turned out, they may have removed no flags, and that was just the way the course was marked. It seemed sparse to me, but then again I've never been great at following marked courses. GPS told me where to go, and after I summited the 2,455-meter Eggerhorn, I veered off course to climb a smaller summit with views of the Eggerhorn's impressive west face. My night in Binn had been sufficiently bad that I decided there would be no more car camping if I could help it. It's a bit funny that I even try to live frugally, because the moment I have any kind of problem, I will gratefully throw any amount of money I possess to make it go away. For Monday night, I booked an AirBnB room in Stalden, about six kilometers from Beat's next life base. The AirBnB proved to be fortuitous, as the owner, Heinz, was friendly and fascinating. His family had lived in the region for hundreds of years. As a boy, he helped his grandfather tend to a herd of sheep in the mountains, and kept a museum of artifacts passed down through the centuries. He led me on an in-depth tour of his museum, apologizing that nothing was "worth any money." I love archives and antiques. I could have spent hours there, with its kettles used until they had holes in the bottom to become flour-sifters, and a huge cart on skis that as a child I would have described as a "one-horse open sleigh." Just great stuff and history, which I never take enough time to explore when I travel. I explained Beat's race to Heinz, and he apologized that he could not recommend good hiking trails in the area. "I don't hike," he confessed. Later, we were having tea, and he began to describe his long pilgrimages across Switzerland and other countries, then pulled out a scrapbook with hundreds of stamped cards. As it turned out, Heinz had completed most of the major pilgrimage routes in Europe, walking many thousands of kilometers and visiting hundreds of cities and towns in the process. When I teased him about his insistence that he doesn't hike, he clarified. "I don't like to walk in the mountains." That's great, Heinz. You and I are a bit different. I still find your life completely fascinating. I actually slept fairly well at Heinz's place, and woke up Tuesday feeling a little more with it. Heinz made breakfast, and we chatted about more interesting places to visit in the area. I regretted that I didn't have more time to explore Stalden, but I had to carry on with stressful driving to Zinal. 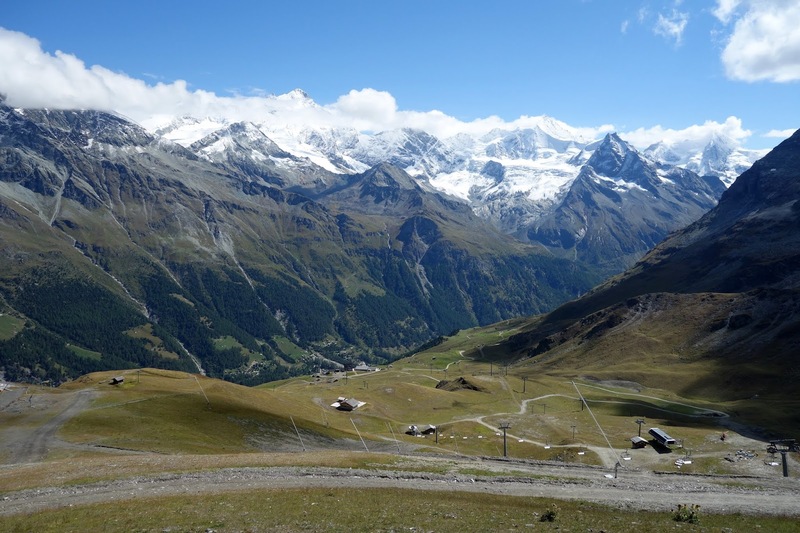 Zinal had a fantastic setting, with stunning views of the Weisshorn and other glaciated peaks. I expected Beat's arrival in the mid-afternoon — I'd started prodding him to send me texts whenever he reached notable spots on the course — and had already purchased the sandwiches and other snacks he preferred over a somewhat limited race menu. 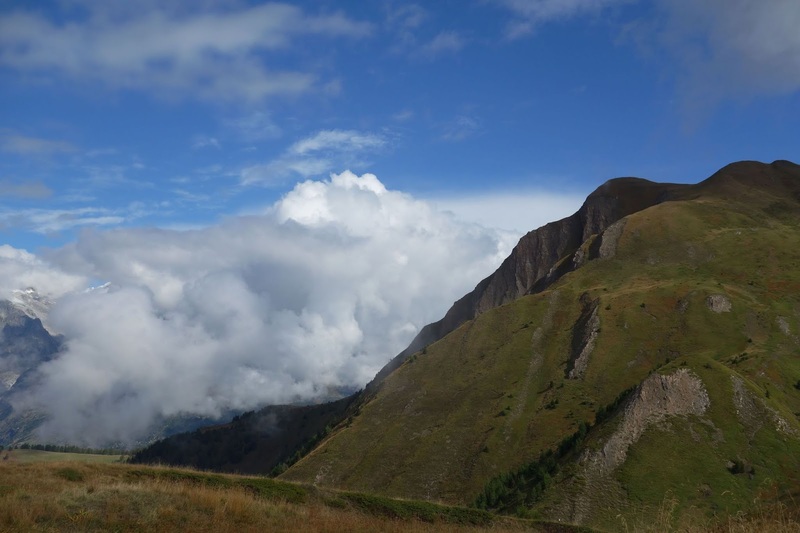 I'd even completed a fair amount of my day's work already, and figured I had at least four hours to hike, so I followed the Swiss Peaks gpx track to Corne de Sorebois. The Swiss Peaks course was again mean, rising straight up the 35-percent incline of a ski slope when there was a nice access road going to the same peak. (Spoiler alert: I took the access road down.) But the views, wow! 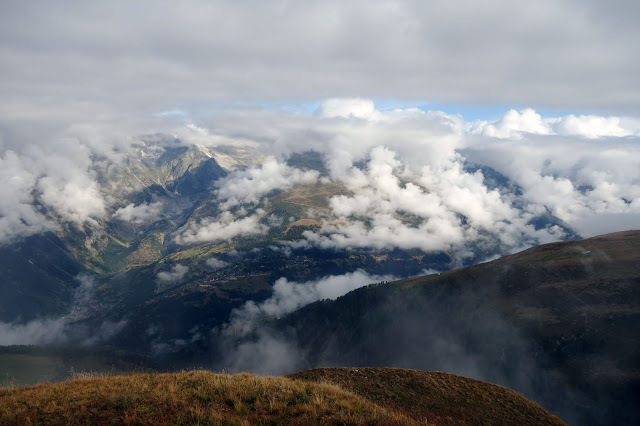 I really enjoyed climbing up to 2,900 meters with a cold wind biting at my nose, and commiserating with a Swiss Peaks runner near the top about the steepness of the slope, even though he had a lot more to gripe about than me. Beat and Dmitry arrived at the life base 10 minutes before me, but for the most part, the timing was perfect. For this night I needed a reliable Internet connection, and actually found a surprisingly cheap hotel room right in town, which I justified by reasoning that Beat could sleep there for a few hours, since it was just five minutes of walking past the life base. But at this point Beat was so tired he didn't even care, and went for the closer cot. I was happy that Beat was doing reasonably well, and didn't have any major complaints at kilometer 160. Even though I wasn't thrilled with crewing at the race's outset, and had a bad first day, I was beginning to think this week wouldn't be so bad. That wasn't entirely the case, but it's nice to look back on the good moments as they happened. I used to worry about missing my thyroid meds until I read that for mine, there is a half life of 9 days. So theoretically it should take a week at least to see symptoms. At any rate, I bet your brain fog was just a result of having been in so many places in a short period of time. You sure get to go to some beautiful places. You could be right. The missed meds happened in the days after the campground incident, but it's unclear whether I'd experience any relapse from this. Theoretically I am supposed to go off my meds in October if my numbers come up normal, a possibility I am both looking forward to and dreading. I am now convinced that crewing is harder than doing the race. However, you *do* get to hike in some gorgeous places. You obviously do a great job of picking out fun things to do while you crew. I hope that your thyroid symptoms were just a blip. Thanks! Crewing is a weird activity. I really do enjoy it, but I wouldn't mind taking another long break from races. Sorry you had to sleep on the ground and eat gas station food in a country with some best food and mountain infrastructure :) Rifugio can’t technically turn you away even without a reservation. Sounds like you and Beat could use a real vacation in the Alps. 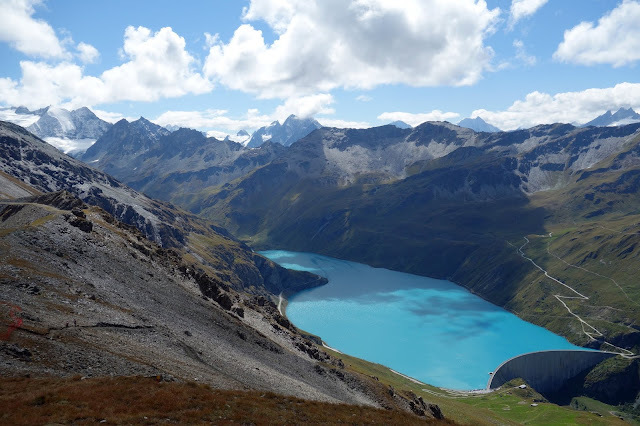 After hiking and biking in the Dolomites last summer, I want to hike all Alta Via routes when I retire in Europe. Regarding being turned away from refuges, some reports I read indicated this does happen if places are full. (Runners who overestimated their distances and had to make changes on the fly.) 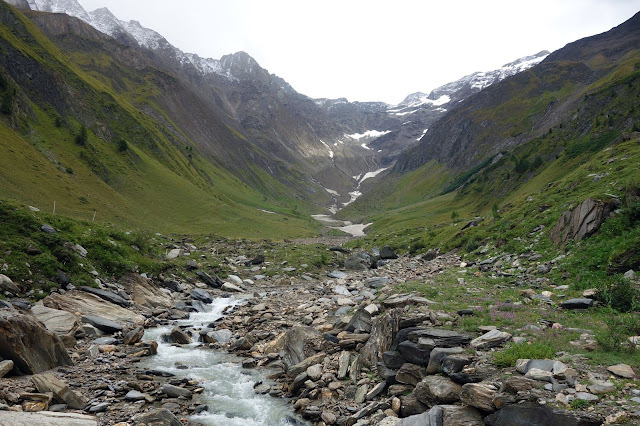 But I think sticking to the more popular trekking routes may not be the best option. 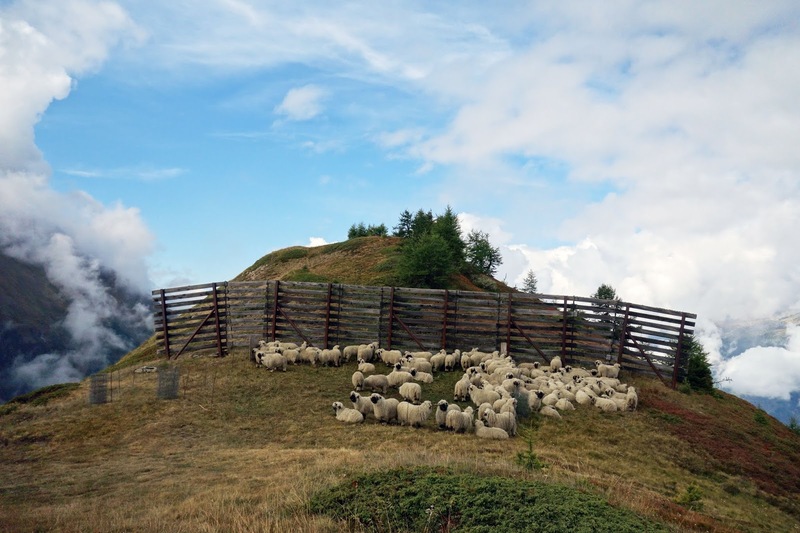 For the best mountain food, it's really all in Italy. We may plan a "real" vacation here someday. Hiking all of the Alta Via routes would be fantastic.